Jacob Armstrong -- Mark Hope dribbles the ball down the field for the men’s soccer team, which made the NCCAA championship tournament and set the program record for wins in a season. The year 2010 was one of the most successful seasons in the history of the athletics program at California Baptist University, and so far 2011 has been even better. Four fall sports programs won titles in the Pacific West conference: Men’s soccer, shared with Hawaii Pacific University, women’s soccer, men’s cross country and women’s cross country. In addition to the championships, Women’s Volleyball posted another strong season finishing tied for third in the conference. Due to these strong finishes in the five fall sports, CBU leads the race for the PacWest Commissioner’s Cup through the fall season. The Commissioner’s Cup standings are calculated by determining each school’s point average per sport they participate in. CBU participated in each of the five fall sports offered and accumulated 47.0 total points. This resulted in a 9.4 average, which put them 1.2 points in front of second place Grand Canyon University. Men’s soccer rode a 10-2 conference record and 15-5 overall record to their first conference title since they won the Golden State Athletic Conference in 1990. “Its always amazing to win a championship in our first year. That was our team goal at the beginning of the year, and we got it done,” Michael Salazar, freshman, said. 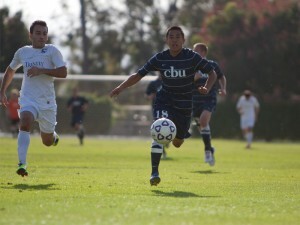 CBU was propelled by a high scoring offense, 2.58 goals per game, led by Osvaldo Bastida and Michael Salazar who were both among the top five goal scorers in the conference. Women’s soccer finished their season 10-1-1 in conference play and 15-2-1 overall. They clinched the outright PacWest championship on Nov. 3, three days before the end of the regular season. “We wanted to take this new conference by storm and prove to everyone that, not only can we compete, but we are the most dominating team in the league,” Kylee Nicassio, senior, said. This is the first conference title in the history of the women’s soccer program at CBU. Offense was the key to success for them, as they scored 3.17 goals per game, led by Nicassio and Fabiola da Silva who finished first and second the conference in goals scored. “It was so nice to be rewarded with the PacWest championship after all of the hours practicing, playing and traveling,” Nicassio said. In a similar situation to the soccer programs, the men’s cross country team added another conference championship and the women’s cross country team won their first ever conference title. Men’s cross country was anchored by lead runners Mitchell Moore and Trevor Henson as they secured their fifth conference title in team history and their first since 2001. They continued on to a third place finish in the National Christian College Athletic Association championships. Ashlee Cervantes was the lead runner all season long for the women’s team, securing the top team time in each event she participated in. After winning the conference title, CBU continued on to a second place finish in the NCCAA championships, led by a sixth place time posted by Cervantes. “Winning the conference was definitely a self esteem boost for our team,” Cervantes said, “It felt great and was well needed.